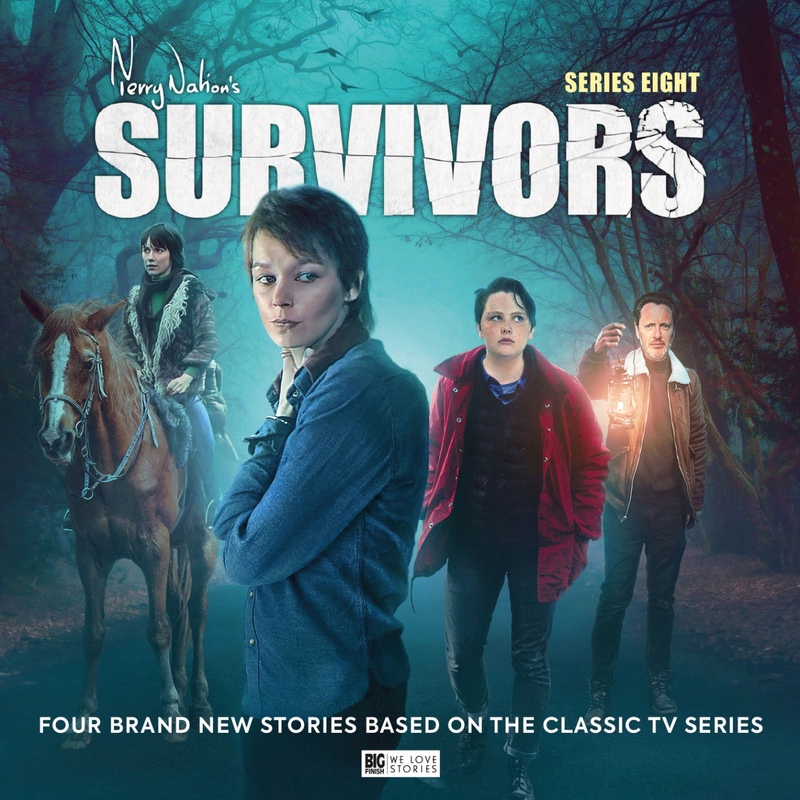 It has been a long thirteen months since the last audio box set of Terry Nation’s Survivors, Big Finish’s continuation of the classic 1970s television drama. With the world’s population ravaged by a deadly pandemic, the series charts the lives of those who are attempting to rebuild against all the odds. Now pushing well beyond the timeframe of the original three-series television run, this new quartet of stories follows the original characters Abby Grant (Carolyn Seymour) and Jenny Richards (Lucy Fleming), the former still in search of her son Peter and the latter as she seeks to expand on the legacy of her partner Greg Preston, by re-establishing civilisation through a federated network of communities. The first half of this episode plays out like an action movie with the train stopped and our heroes attacked, their defensive response moderated by Abby’s fears that Peter might be one of the young marauders. Rescue, when it comes, is in the form of “Captain” Robert Malcolm (Hywel Morgan), a figure whose motivations are less than clear. As the audios are occasionally want to do, we take a narrative side-step to learn about our new antagonist and his personal journey through the early days of “the Death’, Fleeing the city with his sparky shopkeeper girlfriend Twig (a delightful Susie Emmett), but stopping to liberate his institutionalised wife Julia, the story becomes a road trip with the oddest of companions; they end up arriving at the coastal home of Robert’s aged aunt with both Julia and one of her fellow patients in tow. Away from the Grant family drama, which understandably forms the core of this box set, ‘Robert’ is a provocative character piece with terrific performances all around – including two from the writer herself as both Julia and a characterful shopkeeper, and the incomparable Wendy Craig as Elsie. Jane Slavin who is soon to star as Tom Baker’s new travelling companion, has not only created a compelling tale to depict the unravelling of Robert Malcolm’s life, but also finds time to consider the implications of societal breakdown on those in the care of the state, such as it was at the time. This is a terrific story and I am thrilled to see her name again at the top of the writer’s roster for the next series. ‘The Lost Boys’ returns us to the present day where we finally catch up with Peter Grant, a loyal lieutenant to Robert Malcolm in his army of toy soldiers. Indoctrinated and manipulated, he’s rude, self-important and condescending – and that is just to visitors, such as roving medic Ruth (Helen Goldwyn). To those under his command he has the capacity to be much worse too. Through a horrific initiation process Craig, who has chosen to join his group, learns the grim truth of Malcom’s army while Abby and Jenny gain another perspective on through a meeting with a desperate young woman called Cayla (Isla Carter), as some of the dark horrors of this organisation are hinted at. Lisa McMullin may be relatively new to Big Finish, but with a stack of upcoming credits across multiple ranges, including Gallifrey, Torchwood and UNIT, I look forward to hearing plenty more of her work as this is strong, engaging drama. Series 7 opened with the harrowing ‘Journey’s End’, set in the village of Little Tadlow and writer Roland Moore returns us to the same location for the showdown which concludes this run. On the eve of Malcom’s assault, seeking to forcibly recruit all the children safely living there, Abby and Jenny arrive to warn them. Since Abby’s last visit, Little Tadlow has changed, community leader Abraham has died and young Sonia (Katherine Rose Morley) is in charge. With Malcom’s army observing at a distance, Abby finally gets the reunion she has longed for – but it is not long before events consume the pair. For spoiler’s sake I’ll say no more, but Roland Moore’s story certainly does not fail to bring both gravity and intensity to the long awaited moment. And then there’s the battle too! Survivors never fails to be incredibly hard hitting, so it was guaranteed that the reunion between Abby Grant and her estranged son Peter would be fraught with emotion, as well as set in unenviable circumstances. Joel James Davison is clearly a budding talent and he convinces in the moments of vulnerability which show through the cracks in the Peter’s bullish exterior, flashes of the boy behind the teenage soldier. With her son so close, tensions are rife between Abby and Jenny and there are some superb moments between the pair, where Abby’s instincts naturally lean towards her own goal while Jenny keeps a wider perspective and shows remarkable resilience. With this pair having only reconnected in the last series, it is fascinating to ponder how this might have all played onscreen if Seymour had remained with the television show. For her part, Helen Goldwyn again impresses as the spirited medic Ruth, a worthwhile addition to this team of impressive female leads. As the principal antagonist, Hywel Morgan is brilliantly cast and his Robert Malcolm seems eminently reasonable for the most part. Although we learn plenty of his journey, the stories hold off digging deep into his motivations and instead dangle some fascinating titbits which we hope will be followed up in Series 9. Indeed, while drafting this review I had a made a note suggesting that, given the audios are now telling stories past the onscreen series 3, I feared they might be drawing to a close. That has proved to be correct, with a recent announcement confirming that the already slated Series 9 (due June 2019) now will serve as the “Series Finale” for the current storyline. Pleasingly, that same news item also promises “… this isn’t the end of the stories from the world of Survivors”. Quite what this means is anyone’s guess, but I imagine we might hop about the timeline a little, revisiting favourites such as Greg or Daniel, following medic Ruth on her journeys or filling in the gaps with some of the more vivid audio-created characters such as Jackie (Louise Jameson) and Evelyn Piper (Zoë Tapper). Alternatively, one imagines there are plenty of other perspectives to be had on “The Death” and the breakdown of society, perhaps set in other cities or even globally. Wherever it goes, it appears there is a future for the show which is good news: through its immersive sound design, coupled with and raw and uncompromising storytelling, Survivors remains a shining star in the Big Finish firmament. Naturally, I’m giving this a solid 10 out of 10!